This example is not exclusive to PDIP. See below. 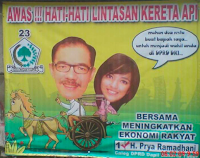 Joking aside, I think that banner is a testament of how dire our democracy is. That voters are anonymous, imitative, uncritical people whose votes are easily swayed by popular culture. That is, if this manner of campaign is effective. Political campaign, I think, is no longer exclusive to political science and debates. The more campaign political parties apply in our daily lives, mostly through the media (television, internet, radio), the more it has entered the realm of media and (popular) culture. Political campaign, historically, was actually developed from the basic idea of propaganda. That a single idea should be repeated, instilled, consistently projected in order to change the 'mind' of the audience. Although effects may be measured, I choose to advocate for the idea that the audience are not a mindless, uncritical mass easily swayed. Part of (that) audience are people with sound judgements which should be approached in a careful manner. But then again, from the perspective of the political organisation, it really depends on whose vote you are trying to gain. 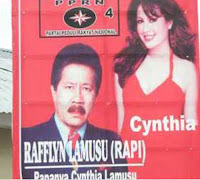 If I were them, and I'm being a devil's advocate when I'm saying this, trying to gain the votes of many (lower educated, lower income, which comprise most of the country's population) the easiest way would perhaps be by endorsing the campaign with as many icons of popular culture (as is the case of Cynthia Lamusu's father). It makes you think, doesn't it? That the manner a political party chooses in its campaign is actually a manifestation of their goals. For political parties which goal is to gain as many voters, then the simplest of options is best. But for political parties which goal is to bear the aspirations of many, campaign will be formed accordingly. Note: I have no strong political stance nor a political position. I have no loyalty towards any party and my vote is based on information and consideration instead of blind loyalty. Which makes me wonder... PKS has consistently attributed the same symbols, meaning and text in their advertising - which lead to the latest controvery of employing newspaper headlines on political disputes between parties. Their courageous political stance led me, a self-proclaimed critical voter, to open their website and read their vision and mission. Browse through online material to find out how the media has portrayed their demonstration, how they organise their mass and what they fight for (and how!). Aside from what their actual goal is, PKS has employed a very intelligent, careful, critical campaign strategy which either is a testament to what they believe in or a testament to how brilliant their campaign manager is. The optimist in me has decided. Oh. This is no endorsement. This is a trigger to an open debate on something that truly matters. Courtesy of Diana Sabidi. I don't like chain mails but I liked the idea. 1. I am a nerd. 2. Unlike what people think of me, I have no ambition. I do, however, have realistic plans. 3. I am married to my bestfriend. 4. I prefer living in big cities but I stay indoors most of the time. 5. I still breastfeed my 6.5 month old son. 6. I enjoy my privacy and I don't like people interfering with my private life. 7. I am a PhD candidate, lecturer, wife and mom. Not in that order of priority. 8. If I had to choose, I would leave everything I have for my family. 9. I am learning to juggle love and life, while maintaining my stress level. 10. I love reading, browsing random sites, writing, traveling and going to museums (I told you I am a nerd). 11. I have been to all continents except Africa. 12. I traveled Western Europe with my husband by bus, train, plane and car. 13. I believe in God. 14. I think democracy is overrated. 15. I believe that violence is never a solution. 16. I am a meat eater and diligently eat my vegetables out of guilt. 18. I love biking in Amsterdam. 19. I like learning new languages only to forget them after 1 year. 20. I am an active TV viewer. I download them and never watch the commercials (eat that AC Nielsen ratings). 21. I believe in open dialogue with people who would listen before they speak. 22. I like vanilla cupcakes, Dr. Pepper, Shirley Temple and Teh Kotak. 23. There are under 10 people in this world who truly know who I am. 24. I collect books and am currently developing my own library. 25. I love children because they represent everything that is right in this world. My husband, Arya, is the type of person who does everything on his own. He works, makes money, cleans after himself, helps take care of our son, and rarely asks for help around the house. A true un-patriarchal husband/father. Sounds perfect, eh? True. But he expects the same from me. Before marrying him, I spent most of my life having live-in hired help. Now our cleaning lady comes and goes and has Sundays off. Two weeks after labour, he asked me when I plan to get back to work. He says lounging around the house and breastfeeding is not a healthy lifestyle. He does support me on all levels - motherhood, career, education. But on the other hand he also expects me to run as fast as I can on all levels - personal and professional. He is not amused when I am idle. There are moments when I am just about to break down and feel that I have had enough. I breastfeed, bathe, prepare food, feed Malik, prepare presentations, write, research, read, budget annual financial estimation for our household. The list goes on. This morning, after feeding, bathing, preparing Malik's diaper bag, washing & sterilizing his bottles, opening & locking the gate for Arya (since we have no help) - it began to rain. And I snapped. Though these moments will always come and go, I know the habits to which I have 'compromised' to adopt have more pros than they do cons. Although it's undeniably more tiring, I whine less over small things and have higher stress tolerance. I am used to doing things myself and I hope one day this will give Malik a good example. And although Arya sets very high standards on me, he also takes care of his end of the deal. He takes care of Malik when I'm occupied (you name it, diaper-changing, bathing, clipping his nails, calming him when he's crying, feeding him, putting him to sleep - there is literally nothing I can do that he can't (aside from producing breastmilk)). After working 10 hours and accidentally breaking a plate, he picks up a broom and mop and cleans up the mess. No whining. He is willing to work around his schedule if I need to work, so that Malik has a stand-by parent (we also don't have a full-time nanny). Sometimes, when I'm extremely exhausted, I ask myself if things have to be this hard. We can actually afford to hire more help, albeit lose more privacy. But when I think of Malik and what kind of life skills I want him to be equipped with - I am reminded of the person Arya is and how independent he is despite the fact that most males in Indonesia are taken care of instead taking care of themselves. How unconventional he is and how this relates to his strong character. How this may relate to decisiveness, agility and perseverance. And at those moments I always decide that all of this is worth it. Not for me, but for my child(ren). I am extremely grateful that I have Arya as my life partner. I can honestly say that I highly doubt I would be able to do all of these things while maintaining my stress level if it weren't for him. And I do hope that Malik gains the best of both worlds. Malik has started on solids for around two weeks and, as I had done with learning everything there is about breastfeeding, I began reading wide ranges of (online) literature on infant feeding. And, as I had with weighing the pros and cons of breastfeeding and expressing breast milk, I began weighing the pros and cons of homemade food and commercial baby food (jar). Most articles advocate homemade baby food for freshness, nutrition and substance control (texture, combination, etc). Not to mention the slogans of 'if you can give your baby the best, why settle for good' and 'feed with love'. Some articles take into account the issue of practicality (working moms, affordability, hygiene, etc) which are less judgmental towards commercial baby food (fortification, controlled hygiene, etc). Then the debate of practicality continues to the solution of freezing homemade food. So did a bit of my sanity. Then I stumbled upon a blog, written by an articulate, caring mother saying that, in the middle of all this debate over nutrition, practicality, what-have-yous, the most important thing is for the mother (or parent) to maintain sanity. You can give your child the best of nutrition but it won't substitute your time spent stimulating their development by being 'present' (broadest sense of the word) for them when playing, learning, interacting. I do agree that nutrition is important, but it is not either or. It should be a balance between both. So I guess, I advocate for whatever works. To each parenting style their own. Homemade food is not always best when the parent has no energy left to play with their child. So I guess, the saying 'if you can give your baby the best, why settle for good' should be applied in a broader context. 'Best' is not only exclusive to what they eat but it also includes reading them books, singing to them, bathing them, changing their diapers and not so easy on handing them over to nannies. And, as a working mom who is doing her best juggling both worlds, I will also try not to be judgmental towards those who decide otherwise.